It appears that the movie was meant to aid in acclimating American citizens to the existence of UFOs and aliens, and the possibility and probability of their eventual arrival here on Earth. Sounds far-fetched? Not really; anthropologists and historians have often theorized that the arrival of Europeans in the New World - and their advanced technology - shattered the indigenous people’s grasp on reality and sent their civilizations spiraling into collapse. 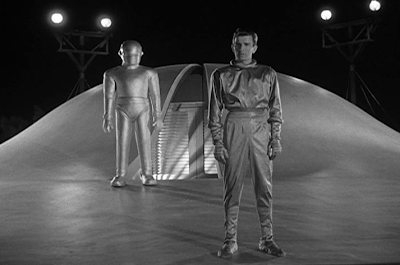 It’s often been asserted by anthropologists and psychologists that if the prophetic “Man From Mars” ever showed up in a galaxy-hopping, cold-fusion powered space craft, society would be forced to rethink everything from our place in the universe to the existence of God - and the implications could be too much for the collective conscious to bear.